Neutrogena produces some of the best known and bestselling skin care products for mild to moderate acne and even created what some call a true rival to Proactiv – the Skin Id system. They are reasonably priced and available in drugstores and discount stores everywhere. The problem with the Neutrogena line is that some Neutrogena products are superb for treating acne, but some will actually make acne worse. This article will help you find the products that actually work for your skin. Some of the ingredients in Neutrogena’s deep cleansers do not clean your skin, but can actually damage it. Neutrogena products are reasonably priced and available everywhere. The problem is that some work really well, and others would work really well except they come with misleading instructions or with ingredients that should not have been included. Hopefully these reviews will help you identify which are which. Neutrogena’s at-home microdermabrasion kit is hundreds of dollars cheaper than a visit to the spa or dermatologist’s office, and it really works. Some of Neutrogena’s facial peels are formulated with the right ingredients at the right concentration and the right pH to remove discolored, brown skin, but if you follow the instructions you will just rinse the benefits right down the drain. One of Neutrogena’s skin peels actually works. Neutrogena hydrating moisturizers are good for maintaining clear skin. Neutrogena’s face wash and deep cleaners would be nearly perfect except they also include ingredients to make your face feel tingly. These ingredients do not clean, and they do injure skin. Neutrogena produces a great line of at-home microdermabrasion products and skin scrubs. These are not products you use to scrub your face. These are products that do all the work of cleansing your skin when you apply them to your face. You don’t have to rub them in or do any extra work for maximum effectiveness. Neutrogena also has retinol products for treating acne that have one thing going for them that most brands do not—they are in the kind of package that keeps the retinol cream fresh and active. Any kind of vitamin you dip out of jar will go bad almost as soon as you open the container due to oxidation. Vitamin products you squeeze out of a tube will stay fresh for several years. Most of the products Neutrogena makes for its Deep Clean not only don’t clean, they can make your skin itch and peel. Their lip balm does not protect the lip against sunburn, and many of the sunscreens are made with alcohol. Adding alcohol to a sunscreen makes your skin feel cool, but it also dries it out and leaves it even more vulnerable to sunburn. Dermabrasion at the spa, by an aesthetician, or at the dermatologist’s office can cost several hundred dollars per visit. Neutrogena Advanced Solutions At Home Microdermabrasion System retails for just US $39.99. You use microdermabrasion to get rid of skin discoloration after acne heals, NOT to cure pimples or other areas of skin inflammation. This is a great way to test microdermabrasion to see how well it works for your face. You dab small amounts of skin cleansing compound on problem areas of your face with the sponge on the head of a vibrating device. Then you turn the device on to rub the compound over your skin. The tiny particles of silica, similar to those to make certain brands of sandpaper, leave your skin with an even tone and feel and probably a healthy glow. The downside to using this product is that it does not have the suction wand used at the spa or doctor’s office that vacuums the crystals off the face. Your skin can feel gritty for hours after you do the routine. And that’s where users of this system need to be careful. The aluminum oxide crystals can build up in the skin and cause irritation if the system is used too often. It’s best to alternate microdermabrasion with a good skin peel product. Neutrogena makes a good acne fading peel with bad instructions on the label. The Neutrogena Advanced Solutions Acne Mark Fading Peel contains the right strength of salicylic acid at the right pH to break down stuck-together skin around pores and to help fade acne marks left after pimples heal. Since the product contains salicylic acid, it’s good for oily skin. The problem comes when it is used on oily, dark skin. Label instructions for this product say that it is OK to use 3 times a week for 10 minutes each time, before rinsing it off. That’s not long enough for it to work. If you follow the instructions, you’ll just rinse any benefits right down the drain. And it’s not a good idea to make up your own instructions as to how long you can keep any product on your skin without burning, especially if you have brown or black skin that can become permanently discolored—after improper use of a product to remove discoloration! For about US $10 more ($24.99 per bottle), Neutrogena Advanced Solutions Facial Peel removes discolored, dead skin the old-fashioned way. It contains microscopic plastic beads that rub the skin away. This product only works if you do the rubbing. 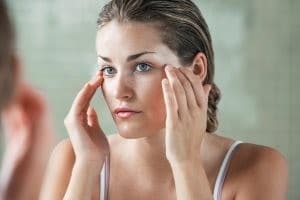 It’s not a “chemical peel.” But because it is not a chemical peel, it’s not going to burn your skin if you leave it on too long or if you put on too much. Just don’t try to get rid of redness. Facial peels get rid of brown spots left by acne, not red spots caused by active acne. Don’t expect Ageless Restoratives Energy Renewal Cleanser to remove makeup, but it can help keep pores open. Here is an inexpensive (US $7.99 for a 5-oz/140 ml bottle) skin cleaner that contains just enough moisturizer for normal to dry skin without any active blemishes. It really won’t keep your skin constantly moist until the next time you use it, but it will remove makeup without any need for rubbing or scrubbing. The feverfew extract is not so much that is can cause an allergy but probably enough to take away any redness from the cleansing routine itself. This is a good product for maintaining clear skin once you have achieved it. Here is an inexpensive (US $7.99 for a 5-oz/140 ml bottle) product that is good for keeping pores open if you use it every morning. Tiny microbeads made of polyethylene plastic get rid of dead skin and grime, but they are easy to rinse away. It’s not the product you should use at night to take off makeup. Neutrogena Deep Clean Products would be terrific, except that most of them include extra ingredients intended to make them “feel” like they are working, and these ingredients redden or dry out the skin. Almost all the Neutrogena Deep Clean product line contains menthol. This chemical from the mint plant makes your skin feel tingly, like it’s getting cleaner. Unfortunately, that tingle is just mild skin irritation, which is exactly what you don’t need when you have acne. If you have no allergies and no chemical sensitivities and nothing ever makes you break out suddenly, then Neutrogena Deep Clean Invigorating Foam Cleanser (US $6.99 for 6 ounces/180 ml) would be a good product, but it would be a shame if the menthol in it made your skin red. On the Spot Acne Treatment works by penetrating pores under the skin to kill bacteria that is responsible for causing acne. This helps stop new pimples from being formed. It is a strong product that can work without leaving your skin dry. With 2.5 percent Benzoyl peroxide, this product is 70 percent as effective as medical acne treatments that have higher doses of Benzoyl peroxide. This makes it quite effective without irritating the skin. Benzoyl peroxide dries up excess oil from the skin, while reducing the size of blemishes. It is oil free and is non-comedogenic, which means that it won’t clog your skin pores. Even though bentonite, the clay base in the treatment, intensifies the drying effect of Benzoyl peroxide and the wax base worsens the blemishes on the skin, this product is still okay for treating on the spot blemishes. Bentonite speeds up the healing of blemishes. Other ingredients included in this treatment are citric acid, which helps to deliver antioxidants to the skin and glyceryl laurate, a skin conditioner. On the spot treatment works best for people who only have acne breakouts once in a while. People who have acne on a regular basis should aim at treating the whole face instead of just treating the affected spots. This is a 3 step acne therapy system that they claim starts working after just 2 days. This isn’t a bad system since it takes advantage of multiple ingredients that target to treat the multiple causes of acne. You are required to cleanse and treat your skin two times a day using all the products in the kit. Use the system consistently if you want to see results. This is a cleansing scrub with 0.5 percent salicylic acid and micro fine beads. The amount of salicylic acid is too small to effectively exfoliate the skin though, not forgetting the high pH, which won’t make exfoliation possible anyway. However, the plastic beads provide for manual exfoliation. This product works by deeply cleansing and exfoliating clogged pores on the skin. It also prevents pimples and helps in treating pimples, blackheads and whiteheads. It is best applied topically as a scrub. Avoid scrubbing it over raised blemishes and in areas which have reddened. May be of interest: The plastic beads used in cosmetic products have been the subject of controversy. Research published in December 2013 in a research journal, the Marine Pollution Bulletin, which is a peer reviewed journal, showed that the beads are not toxic to humans but they do not get filtered during sewage treatment. This means that they are building up in sewage systems and could potentially have a negative effect on marine life that eat them. This is given the fact that these beads absorb pollutants while they are in waterways. However, this research was not conclusive, given that the water used for the research was not obtained from actual waterways. This is an overnight lotion which disinfects the skin. It has Benzoyl peroxide, which kills bacteria that causes acne. This causes the shrinking of pimples and reduces redness and inflammation on the skin. It also helps to prevent acne from breaking out on the skin in future. It is applied topically and doesn’t have ingredients that will irritate the skin. This is a daytime moisturizer, which has sunscreen. It has SPF 15 proprietary botanical complex in addition to DermaNaturals. This helps to safeguard the skin from harmful UV rays, while stimulating the development of new and natural healthy skin. This lotion has zinc oxide, which is a broad spectrum sunscreen. However, zinc oxide is not very good when applied on blemishes since it can cause pores to further clog. It also has scented extracts, which can cause irritation on the skin. Even though this is a three step system it does not mean that it is a one stop shop for acne treatment. You can still experiment and see what works for you. This is given the fact that this blend of products has an active ingredient. In its sunscreen lotion that could potentially lead to skin irritation on some people. Moreover, it doesn’t provide a leave on product with salicylic acid, which can be effective for combating acne. 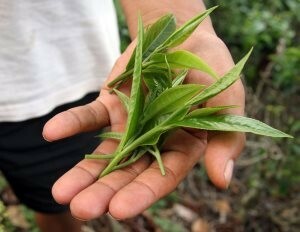 Green tea offers many benefits for treating acne, but the menthol is just asking for skin irritation. Neutrogena Oil Free Acne Wash Foam Cleanser is a creamy product that cleanses the skin. One of the things that has been praised is the inclusion of neem as one of its ingredients. Neem is an anti-microbial and anti-inflammatory product that fights Staphylococcus epidermidis, which is the bacteria that is responsible for causing many cases of acne. It also treats Propionibacterium acne. Neem does not irritate the skin. However, the inclusion of menthol as one of the ingredients means this product can be irritating to most types of skins. Menthol stimulates the production of excess oil on the pores of the skin, which can result in oily skin becoming oilier. Even though this product has salicylic acid and glycolic acid, they do not stay on the skin long enough to have any major positive impact on it. If you have acne, it might be quite tempting to just want to scrub it all the time to get rid of all the blemishes. But with the Neutrogena Oil Free Acne Stress Control Power Clear Scrub, you baby your skin with this gentle but exfoliating scrub, whose ingredients provides a mix that helps to soothe the skin. This product has salicylic acid, as well as cucumber and green tea, which is an anti-inflammatory. It also has 2 percent Benzoyl peroxide. It also contains salicylic acid, but since the product is washed off the face, it does not stay on the skin long enough to have an effect on blemishes. Unfortunately, this scrub also has menthol, which can cause irritation on most skin types. The main ingredient in this product is Potassium Stearate. This ingredient is very drying to the skin like most bar soaps are. Even though your skin may be quite oily, drying it out is not the solution, since this doesn’t help to stop the production of oil. In fact, this may make your acne worse. This lotion has cinnamon extract, otherwise known as cinnamomum zeylancium bark extract, which helps fight Staphylococcus epidermidis and Propionibacterium acne, just the same way neem does. The antibacterial properties in this oil may even work better than those found in many other antibacterial oils, including rosemary oil. It also has 2 percent salicylic acid, which helps to clear skin pores and with a pH of 3.6, it helps to exfoliate the skin and remove blackheads. Neutrogena Rapid Clear Acne Defense Face Lotion has a moisturizing base that makes it quite suitable for normal to dry skin with blemishes. The product contains scented extracts, cinnamon and cedar, that may not cause irritation on the skin given that they are in low quantities. 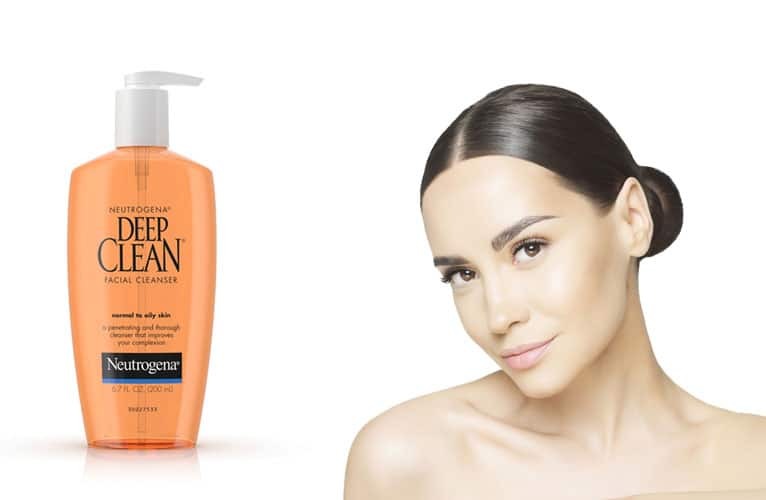 This cleanser is almost identical to Neutrogena’s Oil-Free Acne Wash. What sets them apart is the fact that this product has a grapefruit extract and grapefruit scent. This product may not be very suitable for treating acne, since the 2 percent salicylic acid that the product contains is rinsed off the skin before it has had a chance to have any effect on the skin. The cleansing agent in this product leaves the skin feeling tight and dry. It’s a gritty scrub and that combined with the fragrance used may cause skin irritation for many people. Are you looking for an acne care system that contains only reliable products offered with a money-back guarantee? Try Exposed Skin Care. I recommend you check out our article dealing with special considerations for treating acne on black skin. I'm a 14 year old female who suffers from oily,resistant, and none pigmented skin. I've been using Nutrogena Deep Clean facial cleanser for almost half a year and it works amazing! I actually stopped using it for a few days because it ran out and all my acne came back. I started it back up and it all went away. It's a kind of cleanser you have to use morning and night everyday for best results. I would highly recommended using this line of products! How do I know what face wash and lotion works for me and other products that works for my acne? I have this face wash but I'm scared to use it because I feel I will break out more is that true ? I am very addicted to dermalmd acne serum. It has faded my dark acne spots very well. When new blemishes arise, I apply the gel right away to prevent redness. It often works as a peel for very severe, cystic blemishes because my skin (and the dark spots) will flake off. Be sure to let the gel dry thoroughly before applying makeup or laying on bedsheets.